managing your pain. improving your quality of life. The physicians at PCPMG are experienced in the most advanced, minimally invasive techniques. Working together as a team, the care we provide is comprehensive and unique for each patient. We understand that each individual experiences pain in a different way, and work with patients on a number of common pain areas. 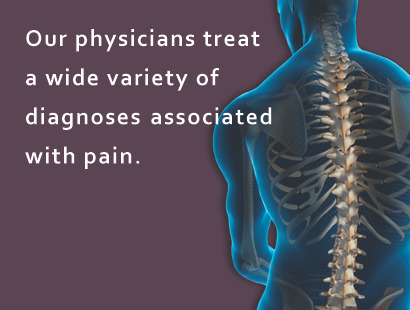 Our goal is to diagnose, treat, or manage your pain in a timely manner and in the most conservative way. Patients in the Upstate can undergo a new, minimally invasive procedure that relieves pain in the knee by deactivating certain nerves in the knee, therefore avoiding surgery. © 2014 Piedmont Comprehensive Pain Management Group, LLC. All Rights Reserved.